Most of my blogs are descriptive and detailed, however I don't think there are words to describe why these burgers are just so good. 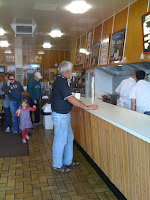 The shop is just a shop, but the burgers are more than just a burger. It's sounds like a long way to for fast food.......but it's worth it. You must eat one of these burgers. The end! You have obviously never experienced what a great hamburger should taste like. 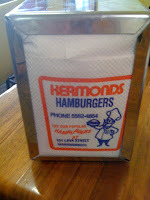 Kermonds may have been good in the old days with not much to compare it to but under today's standards it is a very low class of imitation burger.